inkingpink: Emilys First Birthday Is Sweet! My dear friends are getting ready to celebrate their beautiful daughters first birthday. All first birthdays are special, but Emily's is extra special to all that know and adore her. Emily entered this world several weeks early after her mother was in a head on collision with a driver who fell asleep at the wheel, mom was airlifted and was immediately taken in for emergency surgeries, including a risky c-section. Baby Emily had to be taken to a childrens hospital more than an hour away where she stayed in the neonatal intensive care unit. She and her mother are evidence of the miracles that touch our lives everyday. It brings me great joy to celebrate her life as well as her birthday! 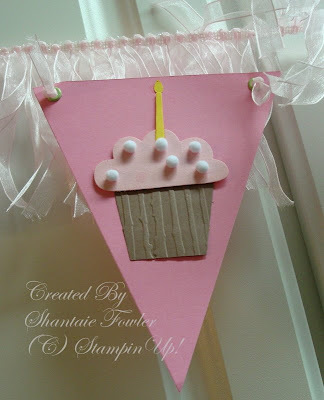 I don't have the sizzix pennant die, so I created this banner by cutting my paper 5"X 6" and marking the center of the 5" side I lined up the corner to the center mark and cut both sides giving me a pennant shape triangle. The chocolate chip scallop circles are a nestabilities die cut, and the letters are chipboard. The die cut cupcake is an exclusive sizzix die from Stampin'Up! This incredible fringe ribbon was discovered at Michaels and I LOVE it! Emily's' birthday party theme is "sweet" so cupcakes are of course on the list! Check back to see all the sweet things we will be doing for her candy coated sugar filled party!